Book professional oven cleaning in Ringwood and deal away with the cooked-on spills, unsavoury food, and harmful fumes in moments. Hire professional technicians for oven cleaning in Ringwood and see how easily they will bring your cooking appliances to pristine condition, using nothing but green cleaning solutions. Cleaners Ringwood comes to your address with a van, equipped with a dip tank where all removable parts of the oven are soaked, and we use non-abrasive pads to scrub the inside of the appliance, protecting its enamel or porcelain surfaces. 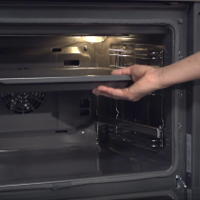 This tried and tested method of oven cleaning completely removes crusted food particles, caked-on fat and burnt-on carbon residue. Your kitchen floors and surfaces are protected from drips and stains, as our technicians use protective sheets and pads, keeping the cooking and food preparation areas spotless. 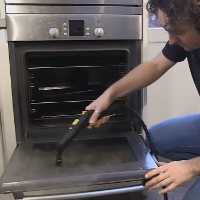 Our oven cleaning method has given excellent results with all kinds of domestic and commercial ovens and cookers, so you can rest assured your appliance – whether it’s gas, electric, combined, built-in or built-under is in safe hands. Our effective cleaning methods also work wonders on BBQs and grills, so don’t think twice to ask us about a combined booking. Cleaners Ringwood can also offer you window cleaning and one-off cleaning, so you can have your entire house spotless top to bottom in just one visit.